eBook PDF (206 pages), PostScript. DVI, etc. This book aims at providing an introduction to key concepts, algorithms, and theoretical frameworks in machine learning, including supervised and unsupervised learning, statistical learning theory, probabilistic graphical models and approximate inference. The intended readership consists of electrical engineers with a background in probability and linear algebra. The treatment builds on first principles, and organizes the main ideas according to clearly defined categories, such as discriminative and generative models, frequentist and Bayesian approaches, exact and approximate inference, directed and undirected models, and convex and non-convex optimization. The text offers simple and reproducible numerical examples providing insights into key motivations and conclusions. The mathematical framework uses information-theoretic measures as a unifying tool. 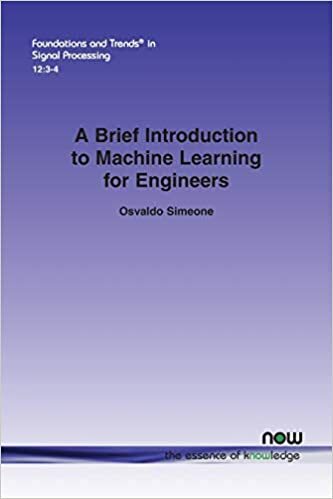 Rather than providing exhaustive details on the existing myriad solutions in each specific category, for which the reader is referred to textbooks and papers, this book is meant as an entry point for an engineer into the literature on machine learning. Osvaldo Simeone is a Professor of Information Engineering in the Department of Informatics, King's College, London, UK.